Hurrah, the holidays are here! School has finished until the 1st of September, so now is the time to restart my bearmaking. 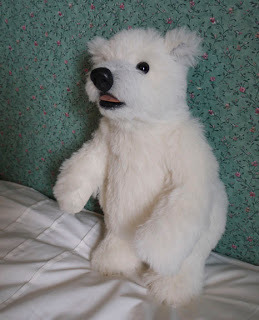 I always have a very late spring clean when school finishes and before we go away...so now that is done, I thought I'd try an open mouthed polar bear. I have tried this before on a number of occasions, but never been pleased with the result. This time, I cut away the lower jaw part of my side head piece and added a small chin gusset. 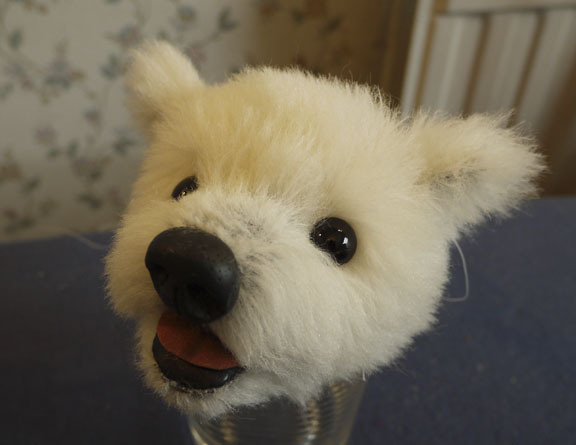 So, today I have completed the head, ready for a double-neck joint and body. 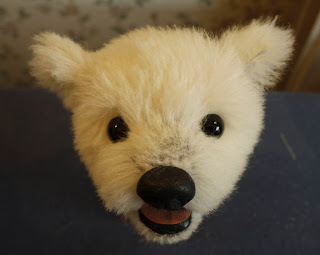 His inner mouth area is soft, black leather and his tongue is ultrasuede that I have painted using acrylic paints. I hope to find time tomorrow. I'm not sure about the ears or their placement. I may trim them and/or move them. I will decide tomorrow. He doesn't have a name yet. 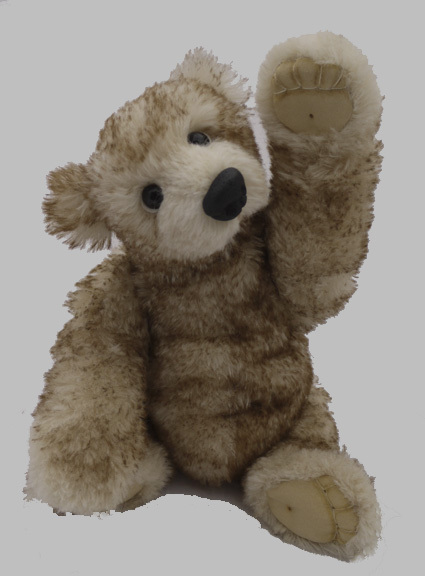 Patrick is a sweet cub in cream alpaca with medium brown tip. He has six joints, including a double-neck joint that allows for a variety of posing positions. His paws are a cream ultrasuede that have been needle sculpted and shaded. He is softly stuffed with polyfil and plastic beads to ensure he is a good weight and excellent cuddle. I have not given him claws, but if the person who adopts him would like them, I can add them. I also made him a sweet pair of dungarees with a cute, teddy pattern on them. Personally, I prefer my bears bare, but if anyone would like to see him dressed, just email me. He has quality black glass eyes with white felt eye whites peeping out from behind them. His nose has been hand-moulded using black epoxy clay. 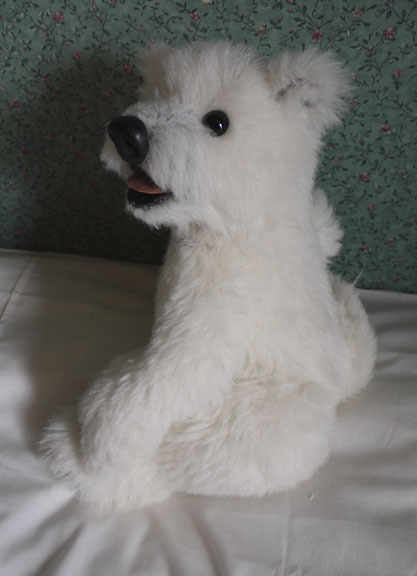 If you would like to give him a loving home, he is £150 including insured shipping. If you would like further information, please email me. 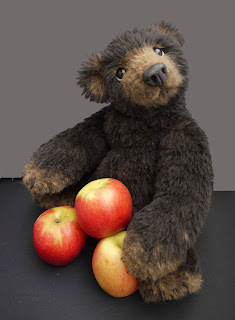 I have just completed a new, realistic styled bear cub. Filbert is a further development of my realistic pattern. 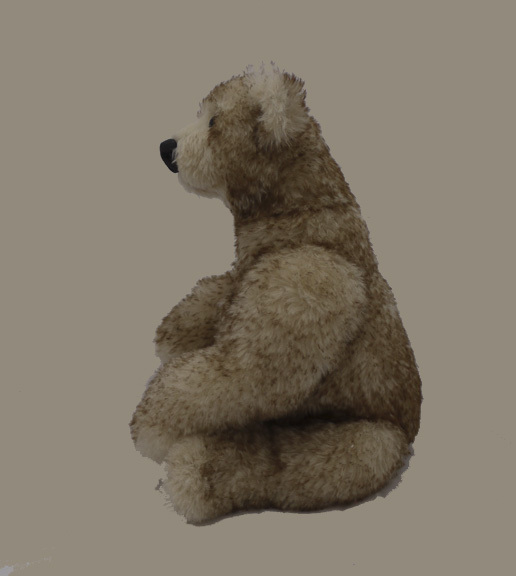 He is 15" tall and made from a dense, tipped alpaca. He has a double-neck joint to allow greater posing opportunities. His nose and claws have been hand modelled by myself using epoxy clay. His paws and feet have been sculpted in leather.